Overland Park, Ks. 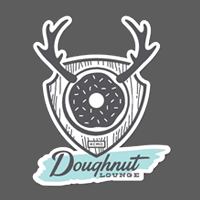 (Jan. 22, 2018) – Doughnut Lounge’s newest location opens to the public on Tuesday, Jan. 23 at 7926 Santa Fe Dr. in downtown Overland Park. On opening day, Doughnut Lounge is giving away mystery prizes to each guest who purchases a box of a dozen doughnuts. Mystery prizes range from free coffee to a Doughnut Lounge Black Card, a card that gets guests one free doughnut a day for life. Doughnut Lounge’s winter hours will be 7 a.m. – 8 p.m. Tuesday – Sunday with noduts and signature breakfast items served until 2 p.m. Doughnut Lounge will be closed on Mondays. The Overland Park location will feature a menu identical to the Westport location with Doughnut Lounge staples such as noduts, signature and classic doughnuts, hot breakfast items, a coffee program featuring Messenger coffee and a full bar which will debut next month. Continuing its mission of craft, creativity and conversation, the completely renovated space offers free Wi-Fi, USB outlets for charging at the bar which seats approximately nine guests and a 24-seat dining area with a garage door opening to a patio for outdoor seating during the warmer months. Doughnut Lounge is Kansas City’s shop for one-of-a-kind doughnuts that opened in Westport in 2015 and in downtown Overland Park in 2018. Owner and operator Jake Randall created Doughnut Lounge as a space for community, creativity and conversation over unique doughnuts, coffee and cocktails from the full bar. The doughnut shop features Classic, Signature and Nodut (a.k.a. Knife-And-Fork Doughnuts) doughnuts, as well as hot breakfast items served until 2 p.m. The restaurant is open 7 a.m. – 8 p.m. Tuesday through Sunday, and closed on Mondays. For more information, visit www.doughnutlounge.com, “like” Doughnut Lounge on Facebook and follow Doughnut Lounge on Twitter and Instagram @DoughnutLounge.